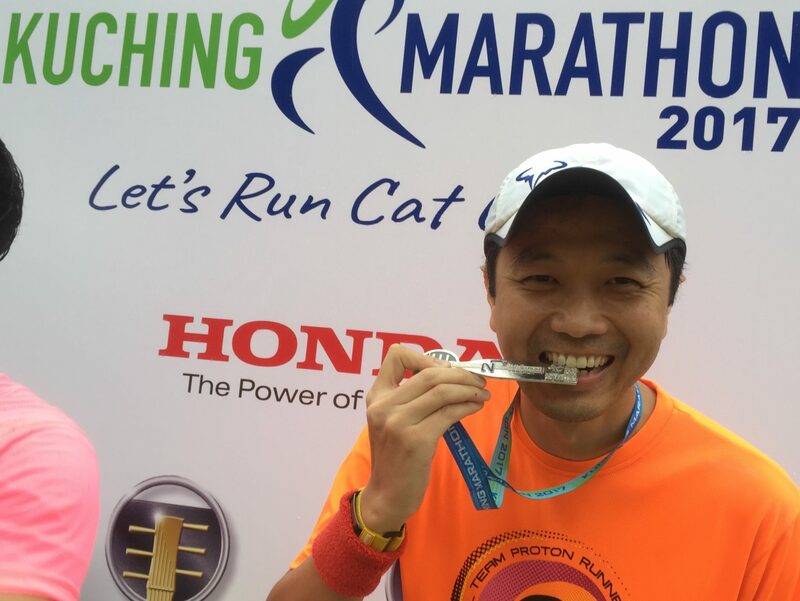 Kuching Marathon 2017: A personal account for the Half Marathon race | JustRunLah! Did you know there’s a special lane at the immigration upon arrival at Kuching International Airport? This is one of the many interesting things I found during my journey to Kuching Marathon (KM17). It’s a small gesture but very meaningful to participants. In town you can sense the anticipation of the event as runners from all over the world can be seen mingling with locals, either buying souvenirs, enjoying the local delicacies and the like. At the REPC, we can visit the many booths in the race expo and there is quite a variety of brands represented too. Race pack collection was a breeze on the second day and the electronic registration system across the many counters really helped. Fast forward to race day, it’s worth noting for drivers like myself to reach town more than an hour before flag off if you want to get a good parking spot. 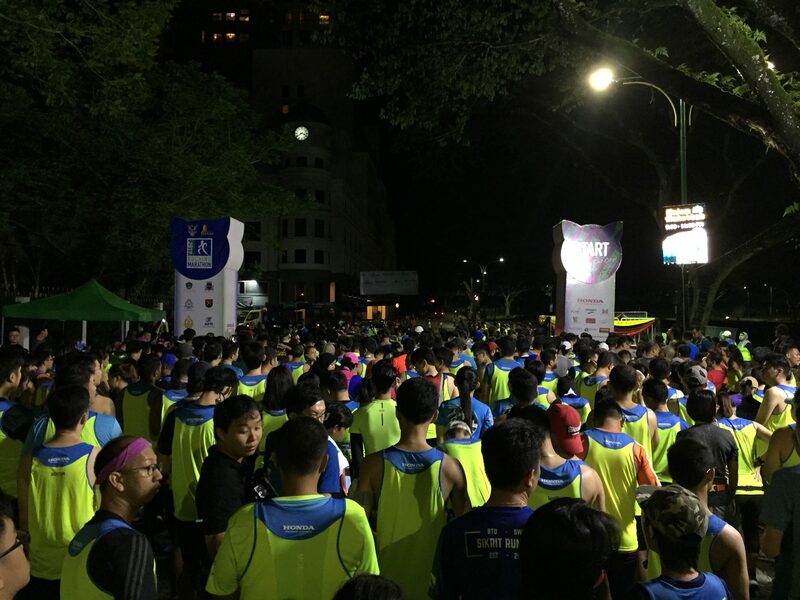 I got my spot just down the road from Wisma Hopoh by 2:45 am and the 200m or so distance to the event venue allowed me a warm up jog. Porta-loos are aplenty so that’s convenient. One thing that struck me was how quiet Padang Merdeka was prior to 3 am and seemingly quite empty too. Was I too early the half marathon flag off? Being early has its perks though; you can visit some of the exhibition booths (Honda takes 180° photos of you), relieve yourself without worrying about queues and stretch in uncrowded spaces. Did you know that KM17 is one of the few races where prayers are recited just prior to flag off? As an international race recognised by AIMS, I find this most interesting. However, I one thing I found not so exciting was the organisers effort to liven the venue. Be it the choice of the emcee or the way music is being played (or lack of it), I believe much can be improved to the likes of Standard Chartered KL Marathon. It’s too quiet! The race itself follows a scenic route around the city and its outskirts (not that you can see much in the darkness) where most of it is well lit except for some sections (like around the pitch dark MBKS building!). This is where the volunteers really helped; they shined the road with torchlights and alerted traffic of our presence. Well done! Safety aspects were very good and this was evident in the dense cone arrangements, RELA presence and traffic diversions. I just wished the road users themselves were more concerned with the runners safety because some can be seen speeding too closely. Volunteers at the water stations were also a sight for sore eyes; so helpful and cheerful at every stop. Water was aplenty as were sponges. But you know what the best thing was? Getting cheers from people who came out of their homes and volunteers. In the still of the morning and even with the light drizzle they really gave us motivation. Personally I feel the last 500m is a such fitting end leading to the finish line. Passing by the historic Old Quarter of Kuching, the quintessential Main Bazaar and Waterfront, overseen by the gleaming DUN and dwarfed by the old Courthouse where finally we are then presented the finisher medal right in front of a colonial Post Office. Such a great feeling to be part of so much history and to complete yet another half marathon. 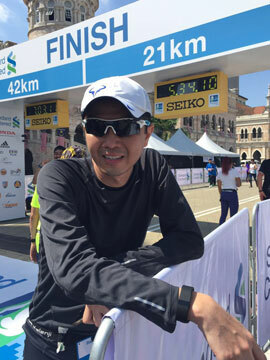 In closing, if there is anything to improve then I would like to suggest for the organisers to make the post-run festivities more happening & vibrant, photo op areas should be aplenty to avoid congestion, there should be rest areas on Padang Merdeka for runners to congregate, meeting points should also be created to ease participants looking for each other. I would love to run this event again. Therefore I will make it a point to return!